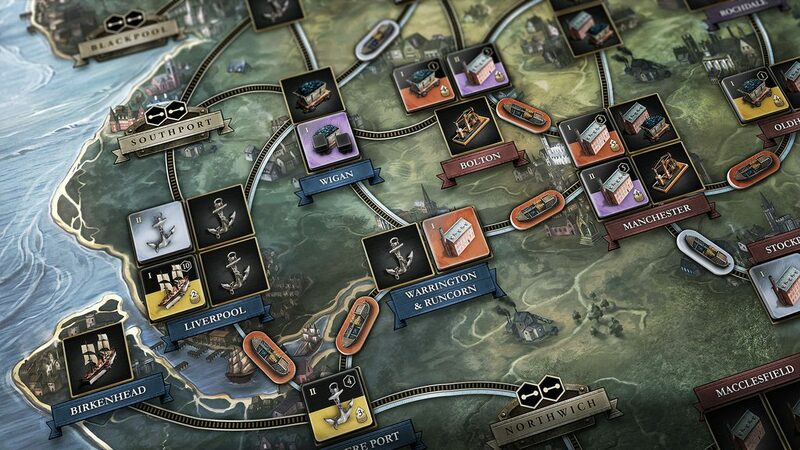 Our Favourite 8 Games From Gen Con 2014! Paul: OK. That title isn’t accurate at all. 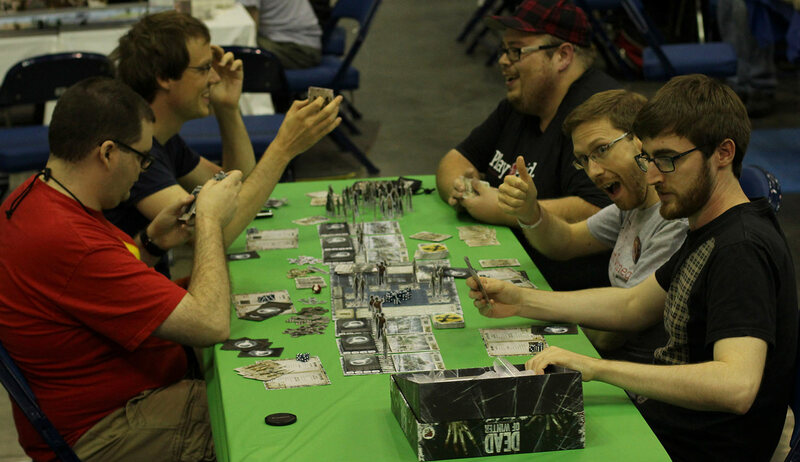 Quinns: Yes, but “Our Favourite 7 Games From Gen Con ’14 and One Game We Were Disappointed By” sounds silly and doesn’t fit. Paul: Fair enough. Wait, which game were we disappointed by? I thought everything was pretty great. Quinns: You’ll have to click through and FIND OUT! Matt: I didn’t manage to stop myself from being explosively excited before sitting down to try the XCOM board game for the first time, which is exactly the sort of dim behaviour that usually leads to endless disappointment. Thankfully we weren’t punished for our childish glee, as it turns out that XCOM 2: THE BOARD GAME (XCOM HARDER) is plenty of fun. First up, let’s deal with the Appaphant in the room. That’s a joke about iPads and animals. Yes, XCOM draws upon the evil powers of electronic devices that were banished from the peaceful realm of cardboard so that we might live a healthy life anew, but no – it isn’t just a daft gimmick or a cost-saving effort to print out less cards. The practical role the app serves is simple: It controls the pace of the game. Orders appear on the app with a timer – Research Brendan! New research, Lab 2. Done? *Press button* Military Quinns! Deploy army mens to mission place! Done? *Press button*. Each task is assigned an amount of time, and failing to complete a task within that period can have immediate negative effects, and also chips away at the time you’ll then have to perform the next task. That’s not a good thing to do, so don’t do that. You will do that, though. Sorry. This system alone justifies XCOM’s digital component, which I can only imagine would be an absolute nightmare if you tried to set it up using sand-timers and string. My main concern was that being APP MAN might be a bit boring, but there’s plenty of stuff to keep you feeling stressed. Incoming UFOs appear on the world map a few turns before they actually arrive, giving you a chance to quickly tell Commander Paul that “Oh god you have to move the interceptors we’ve made a huge mistake”. 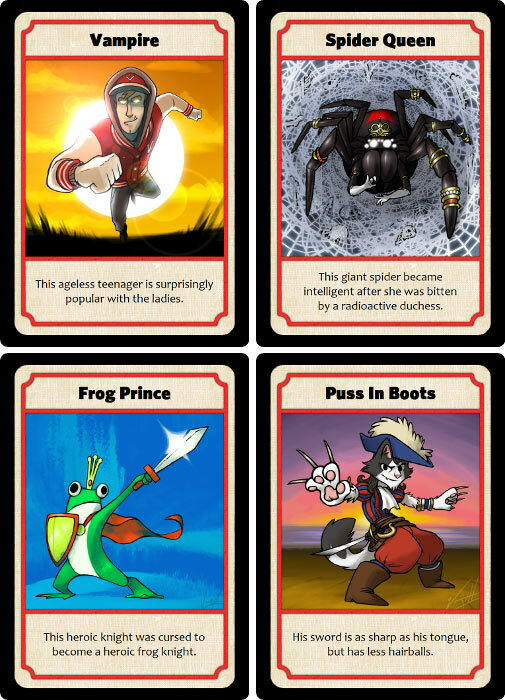 The other variable that ramps up throughout the game are the card-based abilities that research unlocks – some are used in the resolution phase (the bit where everyone stops and breathes, which I’ll trundle onto in just a moment) but many of them have to be used during the timed phase. You aren’t allocated bonus time for sorting out all of this extra stuff either, which means an increasing degree of mental multi-tasking. Oh, and you’ll all be jabbering at each other constantly. There are no rules to restrict you from sharing detailed information, but time constraints force an amazing sense of brevity. The DEATH 1 or DEATH 2 choices the Commander has to make when picking up crisis cards feel a bit too chaotic and lazy for our liking, but largely the design is just smart and exciting – our favourite feature is probably the budget, which the commander has to carefully keep track of. Everything costs a billion dollars, and if we go over then people start to panic. In case you’ve never played XCOM, global panic isn’t something to aspire to. The resolution phase lets blood pressures settle while you carefully go around the table seeing how the choices you’ve made pan out. Adorably, stage one of this is “audit the budget”, but after that each station is resolved with chunky blue dice. The app stuff is smart, but the real design is here: assigning more units to a task means rolling more dice, which increases your chances of getting the engraved-white logos you need to succeed. But you’re also rolling a red D8, too. Don’t get the roll you need on the first go? No problem – just roll the dice again. Oh, but this time anything below a 2 on the D8 will be a failure. Then a 3. Then a 4. Then a hang on Paul why are you rolling PAUL STOP ROLLING OH GOD NO. Asymmetrical team stuff sounds great on paper, but can easily feel disconnected. Games like Space Cadets thrive on the comedy of confusion, but XCOM’s simple universal dice mechanic ensures the team feel united and on the same page. Hopping back and forth between the fragmented confusion of the timed bits and the unified clarity of the resolution phase creates an atmosphere that’s varied and fun, and hopefully a sense of pace that ensures it isn’t possible for one player to act like a back-seat driver. If they can manage to nail that aspect alone, XCOM could be a killer bit of co-op. We’ll need a ton more time with it to see how the devious mechanics hidden in the app shake out when played on higher difficulties, but having spent most of my time at Gencon pining to play the game again, I think it’s safe to say that XCOM is looking quite good. 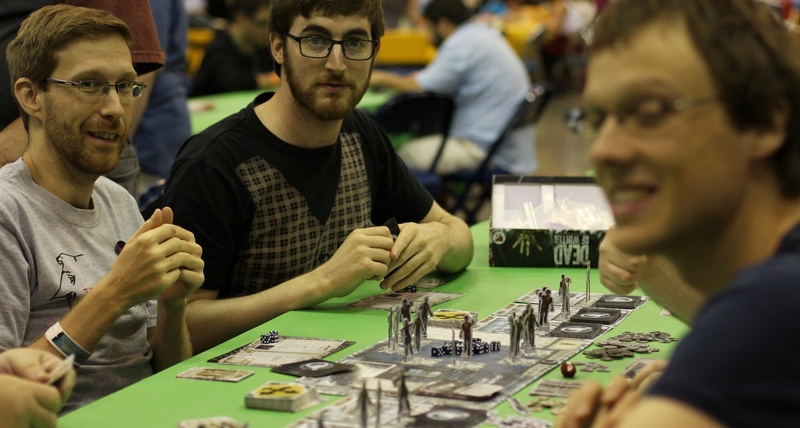 Paul: In a peculiar twist of coincidence, we ended up playing Dead of Winter almost petrified by a cold north wind, right under GenCon’s most overenthusiastic air conditioner. A whole tournament of Axis & Allies was about to begin on our table and, like wee youths evacuated out of a war zone, we relocated far, far away and found ourselves shivering in a very different part of the games hall. Then, we all died in our own poop. That’s not quite true. What actually happened was that I compulsively collected pretty much all the spare food that existed in the game, denied knowledge of any of it and then fled across town to try and shore myself up in a grocery store. In a moment of guilt and helplessness, I returned on horseback with enough to feed us for eternity, only to find that our colony’s overflowing waste had poisoned everyone. And that’s just how it goes. Dead of Winter puts you and your fellow players in a snowed-in colony surrounded by zombies, carefully counting the meagre resources that you’re forever grabbing for with your frozen fingertips. Each turn you need to sally forth to find food, you need to manage your growing waste, you need to shore up your defences and you need to kill the walking dead. It’s hard and pretty much everything is a risk. Travelling is a risk. Scavenging is a risk. Making decisions is a risk. The thing is, while you obviously all lose if the colony is overrun, starves or dies in its own mess, every player also has their own secret objective. That might be collecting certain resources or fulfilling particular conditions, but it always sees you behaving just a little weird and maybe, maybe your companions start to think you’re an outright traitor, someone who intends to betray them. Fair enough. I certainly was. I just couldn’t quite fight back the zombies who were surrounding the new home I chose, so I decided to come back and make the best of it. The best of it still being dismal failure, of course. Our game of Dead of Winter was a good first impression. It’s a game of cruelty and suspicion and petty advantages. I never told anyone about the padlock I had. They’ll never know. 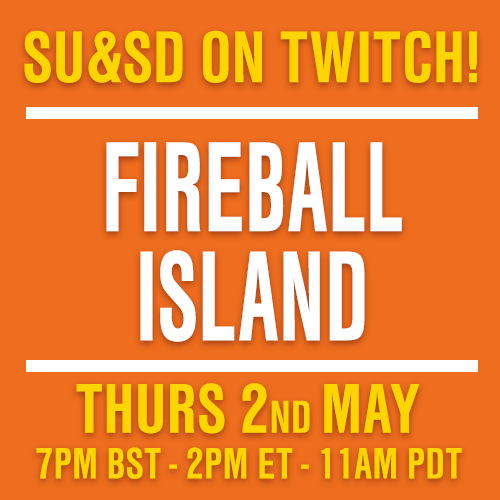 Brendan: Quinns has already praised this beauty of a hidden role game on Podcast #10. But GenCon was the first chance any of the rest of us got to try it. I was not disappointed. 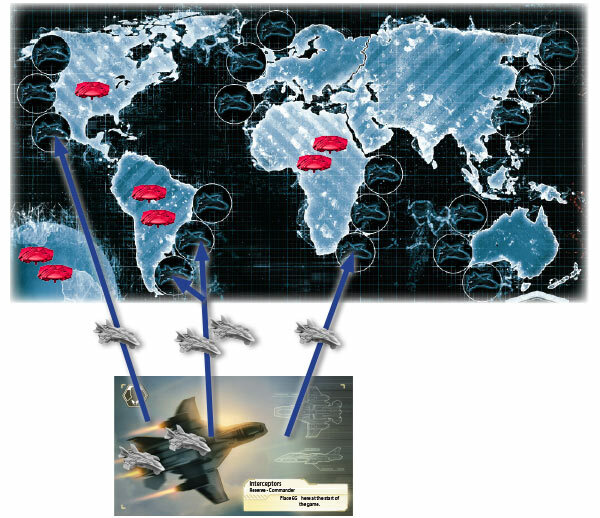 Basic rules: there is a red team, with a bomber. There is a blue team, with a president. The reds want to get the bomber in the same room as the Prez by the time the fifteen minute timer runs out. The trouble is, the people in your room at the start? You don’t know what team they are on (everyone gets a card with their role on). And any minute now you are going to have decide who to send to the other room. Who will it be? Will it be that shifty guy with the hat who won’t show anyone his card? Will it be the girl who just vied, unsuccessfully, for the leadership of the room? And what team are you on anyway? WHAT TEAM ARE YOU ON? ARE YOU A DIRTY RED? ANSWER ME. Almost 30 people (!) took part in each of the games I played and the chaos of that high player count only made the whole mess even better. My favourite memory was being a vanilla blue team member and working with the President, his Doctor and his Mistress (yes, there is a card for this) as well as a motley crew of grey card-holders (read: potential turncoats), to thoroughly vet every single person who entered our room. We went at them like a dogs, like wolves, like US Customs Officials. “Who are you? Why are you here! ?” And turning to our good cop associates: “Do you know this person? Who are they! ?” It was the best feeling in a game to co-reveal my card to someone with a red card and simply say to them: “You’re out of here, Red. Next hostage swap? You’re gone.” Because I knew I had the leader’s ear and nobody could stop me. Honestly, I felt like Malcolm Tucker. Quinns: The conditions in which Matt and I played Sheriff of Nottingham for the first time were amazing. It was 2am, and we’d each been given a tumbler literally brimming with whisky. “WHAS IN THE BAG,” probed Sheriff Matt, holding my little red velvet pouch between thumb and forefinger. “whas inna BAG,” Matt insisted. If I can be vulgar for a moment, Sheriff of Nottingham is a game of “what’s in your bag” both literally and figuratively. Each player is dealt a hand of cards depicting legal goods (cheese, chickens, apples) and contraband (pepper, ale, or precious crossbows). Players can discard some of these, draw some more either from the face-up discard pile OR a teetering draw pile, and then sequester anything from one to five cards into their tiny velvet pouch before tossing it to whoever’s the Sheriff that round. Acting as a customs inspector, the Sheriff then asks each player what’s in their bag, and you must make eye contact while explaining that there’s four chickens, or five apples, or maybe two cheese. The Sheriff then decides whether or not to open the bag, with two amazing rules. 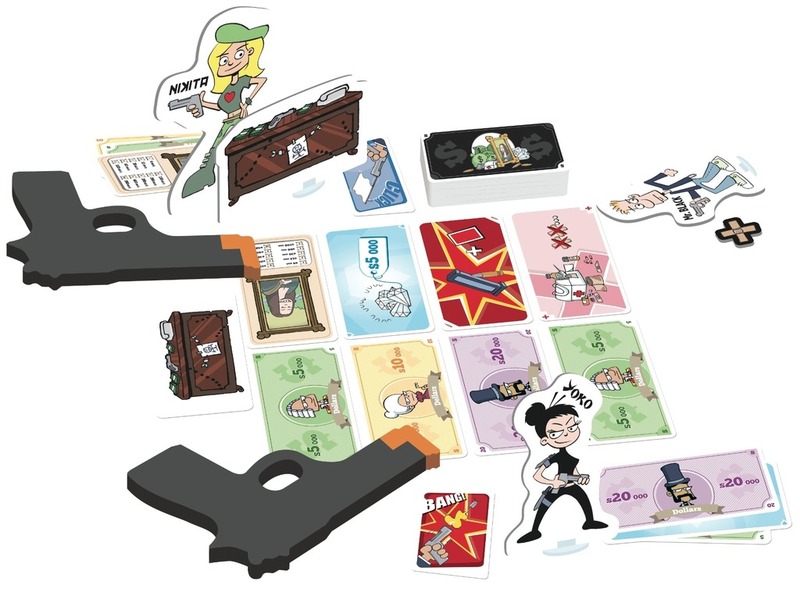 First, any player can offer the Sheriff money to open the bag or keep it closed, and second, discussions are over the instant you hear the “click” noise of the Sheriff popping the button that keeps the bag closed. You haven’t lived until you’ve heard the laugh that goes around the table when you hear that click in the middle of a merchant’s stuttering explanation. At this point you all get to enjoy an astonishingly theatrical moment where EITHER the merchant was telling the truth and the Sheriff pays them with money out of their own pocket, or they were lying, and they pay the Sheriff an exorbitant fine. I was too drunk to realise this while we were playing, but this also means that throwing the Sheriff a bag with five cards is an awful proposition for them. Because the losing player must pay the printed fine on every single card, it’s far safer to let them through,. Except then if the contents of the bag are five crossbows draped in a thin sheet of cheesecloth they’ll have practically won the game. There are some extra rules to do with rare items, delivering the most of a legal good for a bonus at game end and even offering the Sheriff items from inside of your bag, but really, you’re going to want this game because it has players producing more hot air than a hair dryer. At last, Skull & Roses has a competitor! 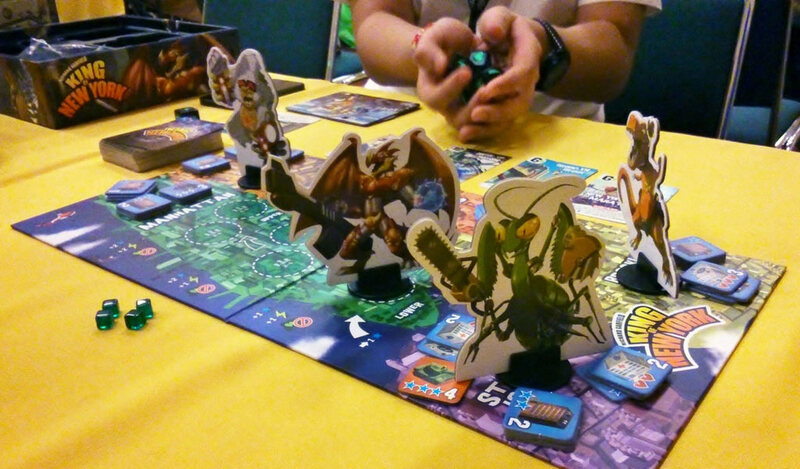 Matt: King of Tokyo was one of the first games I stumbled upon when getting back into modern board games, and initially I was successfully wooed. Big chunky dice! Big chunky monsters! big chunky colours! Edible green cubes! Since then though, my opinion has shifted – perhaps because my tastes in games has slightly changed, perhaps because Quinns has been whispering things into my ears while I sleep at night. Who am I to judge/launch legal claims? The long and short – I’m not cut out for knock-out games. I don’t like being knocked out, and because of that I don’t like knocking other people out either. I’m well aware that other people love it, but from my perspective it simply feels like poor design (Werewolf and Skull & Roses remain my big exceptions: in the former silent people-watching is excruciating fun, and in the latter if you go bust it’s almost definitely mostly your fault). Despite my recent reservations I was pumped about playing King of New York. Scrapping the numbers on the original dice for stars, buildings, and ominous skulls, the sequel had clearly fully nailed the theme. Destroying a building in a district flips over the tile to reveal an army unit, neatly creating a sense of escalation as your big beasts tear things up. And fame! Oh, fame! So many monsters, so little limelight. Roll three stars and you’re the superstar up until another player dethrones you, which means racking up victory points for every star you roll. On paper it all sounds new and exciting, but in practice it plays out like the exact same game – which I’ll admit I found to be a bit disappointing. The main big difference I noticed was pace – having armies that can rough up monsters too ensures that games don’t drag on forever. If you purposefully manage to roll three skulls, all military units in play will be triggered – potentially causing a shedload of pain. The superstar stuff also ensures that aiming for victory points is still viable too – if not more so than in the original game. Faster pacing means less time spent with players knocked out, but I wouldn’t be fooled by the cool new bits – underneath the surface King of New York feels very much iterative rather than innovative. Whether or not that’s a criticism is entirely up you YOU and YOUR BRAIN. Brendan: This game was bequeathed to me by someone on the same night (thanks, Adam!) It’s a creative game between two teams where each player plays a hero – a minotaur, a rat king, a mummy – and keeps an item card in their hand – a poison dagger, an anvil, a flying carpet. The teams are going to FIGHT. Once everyone is ready, a card is revealed that shows where the fight will take place. It might be in a dark castle, a prison made of candy, or a high school. A fifth player is appointed judge and now, LET BATTLE COMMENCE. Oh yes, I forgot to say: you fight with storytelling. So players will appeal to the judge, telling them what their character would do and how they would fight the other team. It’s a bit like a playground argument of the ‘who would win’ variety. “But no, because my Centaur takes off his horseshoe and throws it at the Gargoyle’s head!” Except, the group I was playing with accidentally discovered the best way to play Story War. Which is to pretend that the judge is famous TV personality Judge Judy, that the fight took place in the past, and that the whole table is now on trial. This led to ridiculous arguments over whether or not a Golem and Nymph had planning permission to build a wall in the crystal cave. The same crystal cave that Banshee and Vampire were due to play a concert in! (The band subsequently couldn’t perform because of the potentially illegal obstruction). Another ‘fight’ saw a case brought by a Mermaid and a Kraken being thrown out after the Judge ruled that they had unfairly squatted in the Treant’s home – a foggy bog. Quinns: Oh my god. Oh my god. Two things, before we begin. This is the most fun some of us had at the entire convention, and sadly, you can’t buy Funemployed! just yet. 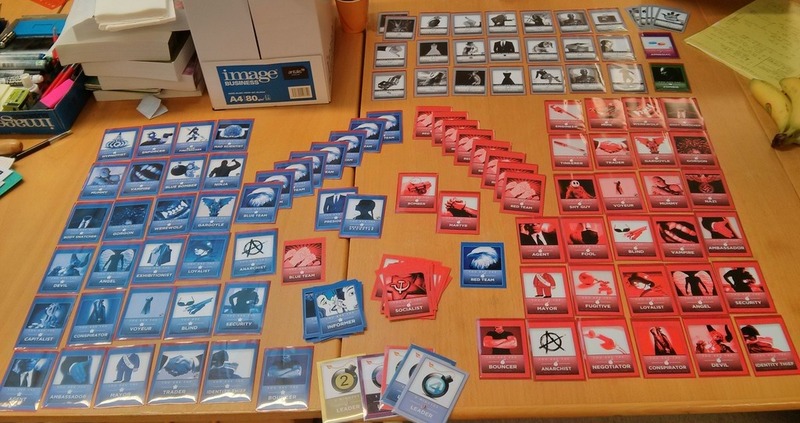 Following Kickstarter fulfillment the game is looking for a proper publisher, but don’t worry. We’ve heard it’s getting one, and the instant you can buy it we’ll post our review. Funemployed! is a party game along the lines of Snake Oil or Cards Against Humanity, but it blows them both out of the water with the force of a depth charge. Each turn, one player is a job interviewer looking for a personal fitness trainer, or a nanny, a used car salesman or anything in between. Each other player is then dealt four cards in preparation for their job interview. 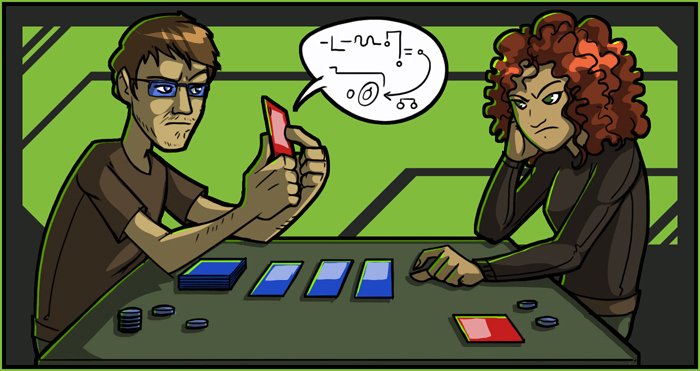 Players enjoy a brief panic where they can throw cards away (face up) and pick up other face up cards, frantically reshuffling their personality, and finally each player goes through a quick job interview using ALL of the cards in hand. Here’s the thing, though. These cards are abysmal. I had to interview for an altar boy position when one of my cards just read “Apples”. Someone applying for my gym had “In the closet” and “Beard”. And who could forget Matt’s sincere application to be a pimp, where his entire resume read “Jazz hands”, “Beefcake” “Katana” and “Hot mess”. The reasons that this is so much funnier than anything we’ve played are subtle, but undenaible. One, everyone has emotional memories about past job interviews, so the chance to witness miserable ones is cathartic. Two, the interviewer is a built-in straight man (meaning, a character who’s normal, revealing the comic absurdity of everyone else), and watching them just try to get through the interview is hilarious. But most importantly, the cards act as a staggered punchline. In Snake Oil or Cards Against Humanity you put down your card combination and the joke struggles from there. Funemployed! lets you keep your punchline back, first constructing a funny character in front of everyone, and then subverting everyone’s expectations. We had a meek, Russian-accented intern applicant who played “slender” while stating they wouldn’t get in the way in the corridors of the office. “Unless you want me to get in way,” he said, quietly putting down a card that read “SEXUAL TYRANNOSAURUS”. It’s just astonishing. I found myself laughing just looking at the cards I’d been dealt. And best of all, the last card people apply for in the game is always “Your actual job”. Genius. Paul: I lost all respect for this game when I sat down to write this and realised it had dollar $ign$ in its title, then immediately regained all that respect because it’s amazing. Ca$h ‘n Guns is Reservoir Dogs meets the Three Stooges, gangster standoffs with physical comedy, deception and absurd misunderstandings. You start the game with a foam gun and a handful of bullets and end it with either a clutch of stolen goods or an appointment at the morgue. The biggest clutch wins. All you do in a round of Ca$h ‘n Gun$ is decide if you want to load one of your few bullets into your gun, decide who you want to aim your gun at and then, once all guns are drawn, decide whether you’re happy facing down the one-eyed stare of whatever pistol might be pointing your way. Opt out and you shoot no-one and collect no loot, but nobody shoots you. Naturally, you might not have any guns pointed your way this round. Or you might have agreed with a trusted friend to load only blanks. Or you might be the Godfather, the privileged first player who can order one other to turn their weapon somewhere else. Whatever the case, if you’re still standing, you wait your turn to grab at whatever loot has been laid out this time. Then you do it all again. Eight times. Except next time it’s all different because that player shot that player who now has a grudge, except that player has no bullets left and that player’s clearly getting to rich, so you need to convince that player to shoot that player, the one who lied to you two rounds ago. Do you remember all that? Of course you do. Just don’t get shot three times. How hard can that be? Quinns: And that’s it! Except it’s not. Paul: Not even a little bit. Quinns: Keep an ear out for our podcasts in the coming months, where we’ll doubtless be leaking still more information like faulty shower heads. Needless to say, it’s going to be a fantastic year. 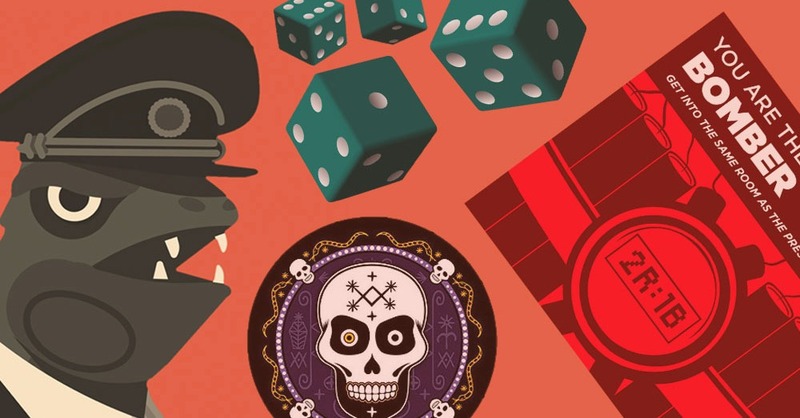 How to build an amazing board game collection for $10!